Cold Much? Here Are Tips From NPR's Northern Stations : The Two-Way Merino wool gets a big shout-out; so do flannel-lined pants. Warming up the car is a good idea — but stay in the car in Eau Claire, Wis., or you'll face a steep fine. Pedestrians walk along Michigan Avenue in Chicago this week. Bitter cold is hitting much of the Northern half of the U.S., with temperatures dipping into the single digits and below zero. The extremely frigid weather is expected to last for days. If you insist on seeing the outdoors, you may want to rely on photos — like the images of sea smoke, steam devils and pancake ice from the edge of Lake Superior that Minnesota Public Radio is featuring. As the station's Derek Montgomery writes, "The frigid temperatures had an upside in Duluth this week, bringing spectacular waves of sea smoke to the harbor. Sea smoke forms when colder air moves over warmer water, the same principle leads to lake-effect snows." In Vermont, where it was 10 degrees below zero Thursday morning in Burlington, member station Vermont Public Radio asked the Reddit community for tips on staying warm. The highlights, as listed by VPR, range from a reminder that shoveling snow can cause heart attacks to advice for avoiding frostbite and hypothermia and preventing carbon monoxide poisoning. The highest-ranked response to VPR's Reddit callout was simple: "Add merino wool to your layers." Among other suggestions: Try flannel-lined pants. "Starting around -25 you might want to think about covering your eyes, especially if it's windy. Use a wool scarf," a Reddit user named TaoistInquisition wrote. "Layer but don't let yourself sweat, if you are stuck outside and you are sweaty, you are at a high risk!" Another person wrote, "Aside from the valuable information already posted here, use matches not lighters. It seems silly but if your pilot goes out in February and you wake up freezing your lighter will not work." "My best tip is to embrace it, be cold and enjoy it. You are generally not in any real danger as long as you made good preparations. Exercise in the morning while the fire is catching, stretch a lot and occasionally go out in the cold at night and experience the complete darkness and quiet which many will never get the chance or seize the opportunity to take." He added, "Wool socks are a must." For anyone driving in the intense cold, the suggestions included preparing your car as if it will break down: Keep a pair of winter boots in the car and pack it with a sleeping bag and hand warmers. While it's a good idea to let a car warm up before driving, Wisconsin Public Radio says that you should stay in your vehicle when you warm it up in the city of Eau Claire — or face a fine of more than $200. "In October, two vehicles were stolen in Eau Claire after being left running while unattended," WPR reports, adding that "in both cases the owners were cited." In Wyoming — the most dangerous U.S. state to drive in the snow, according to a Wyoming Public Media report — drivers should be particularly careful. An analysis from the SafeWise website found the chance of a snow-related crash was 1.5 out of 100,000 people. To help avoid accidents, drivers should maintain a 20-second gap with other vehicles and listen for the quiet that could signal black ice rather than snow under a car's wheels, Safewise's Sage Singleton tells WPM. Motorists: Keep your gas tanks at least half full to avoid a gas line freeze-up. Pack blankets, gloves, hats. Make sure your tires are properly inflated. Make sure your exhaust pipe is not clogged with snow or ice. Drive slowly. These are a few of the cold-weather tips provided by AAA. Beware of black ice. Roads may look clear, but they may still be slippery. "You get much below 10 degrees and salt is somewhat ineffective," says Bill Boynton, spokesman for N.H. DOT, who recalled the flannel-lined jeans advice from one of his co-workers. If one experiences an automotive issue while driving, pull off to a safe place. Make sure windows are defrosted and clear. And be sure to clear snow and ice from the top of the vehicle. State Police continue to remind people of this, part of the negligent driving statute known as Jessica's Law. FEMA has a winter weather toolbox. Its recommendations include keeping tabs on the latest forecast and having an extra emergency kit for the car. It also warns people to be careful not to overexert themselves when shoveling snow or pushing a vehicle out. The National Association of Realtors maintains a list of ideas to winterize homes and prepare for cold weather. Public safety leaders remind people to also check on their supply of fuel oil and wood. In Montana, where the city of Malta's low on Christmas morning of -31 degrees was 99 degrees colder than the 68 posted by Key West, Fla., on the same day, a key question is how much more snow people there can expect. Montana Public Radio says it will be heavy and could last through Sunday, depending on the behavior of a "plume of warm, moist, subtropical air known as 'the Pineapple Express' " that's moving across the area. The deep chill will last for days across much of the Northern half of the U.S. — including in Nebraska, where high temperatures might not rise above zero degrees this weekend, as Mike Tobias of member station NET News reports. The National Weather Service office in North Platte is telling folks in Nebraska, "Enjoy the 'warm-up' today, bitter cold temperatures return to the area this weekend." 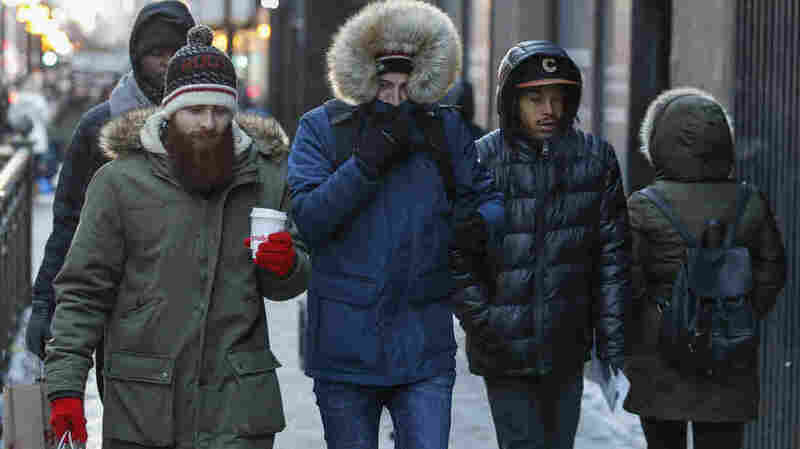 The office predicts dangerous wind chills from -15 to -45 degrees on Sunday and Monday mornings.